Handling objects is a common task; examples are loading and unloading machines, manipulating (điều khiển bằng tay, thực hiện khéo léo) objects in assembly and inspection, or using hand tools. Material handling (lifting, lowering, carrying, etc.) involves short-distance movement within the confines (hạn chế, tiếp giáp với) of a building or between a building and a transportation vehicle. In focusing on material handling at the workplace, especially the design of machines for proper manual feeding and unloading, one can distinguish (phân biệt) between two cases. In one, raw material such as sheet-metal, pipe or solid stock is cut and worked (sheared, punched, milled, turned, etc.) by the equipment; the human activity mostly involves bringing the raw material to the machine and inserting it. The operator does this by hand and body motion; if the material is bulky or heavy, two operator may be needed to manipulate and move the material. Bulky and heavy material should be so stored that it can be moved easily by two operators without bending and twisting. Storage facilities, paths between there and the machine, and proper loading provisions (sự dự phòng) must be planned. In some cases, it may be possible to use jigs, rollers, or conveyors. It is important that the work height for the material handler is appropriate. Keep storage and the loading station at about hip height for heavy objects, and at waist or event chest height for light material. If, in the other case, single pieces of material are provided and must be loaded, one by one, into a feeder magazine or directly into the machine, the loading fixtures of the equipment itself must be so designed that the operator does not have to bend or twist the body. The manipulation area should be close to the body, in front of the trunk. The location of containers for raw materials or for machined items is of great concern if overexertion (sự gắng quá sức) injuries of the material handler are to be avoided. Containers should not be put on the floor if this requires the worker to bend or "dive" into them to order to retrieve or deposit material. Avoid twisting and bending the trunk by storing containers at proper height and angle. Instead, the bins, trays, or containers should be placed in such a way (raised, titled) and be such a size that the operator can work with an upright posture, grasping (nắm chặt, giữ chặt) and moving the objects in front of the trunk and close to the body. Method commonly used in industrial engineering are suitable for the evaluation of planned or existing material handling. Employ (sự dùng) flowcharts and flow diagrams as well as motion analyses and other work study techniques familiar to the industrial engineer (see Ref A below). These techniques allow a motion-by-motion determination of the activities involved, and of their ease or difficulty for the operator, which in turn facilitates determination of the best work method and equipment design. I was shocked (cú va chạm), dismayed (mất tinh thần), and perturbed (lo sợ). Recently, I attended a regional industrial exhibition that had an emphasis (tầm quan trọng) on materials-handling equipment. I intentionally went around looking for bad or lacking human engineering. I found plenty...inadequate (không thích đáng) labels; wrong-size controls; lack of shape, position, color coding; control that could be inadvertently (tình cờ, không cố ý) actuated (là động cơ thúc đẩy); absence of guard rails; unintelligible instructions; slippery surfaces; impossible reach requirements; sharp edges; unguarded pinch-points; extreme strength requirements; lack of guards; spaces needed for maintenance too small for the human hand; poorly located emergency switches; and so on and so on!... Spacecraft and supersonic aircraft and missile monitoring equipment need human engineering; so too, do hydraulic hoist and folklift trucks and conveyor system and ladder. Usability is an important aspect (bộ phận hoặc nét riêng biệt của cái gì đang được xem xét; khía cạnh; mặt) in machine design; if the "human factor" is neglected (lôi thôi lếch thếch), clumsy (vụng về, không gọn; khó coi), difficult, and unsafe condition result. There is now ergonomic information available for engineers that enables them to design equipment, work stations, and tools for safe, efficient, and easy working. The references provide extensive (một tầm nhìn rộng) and quantitative data (dữ kiện, tài liệu phân tích) for designing machinery and equipment ergonomically, to assure its usability. The word ergonomics (khoa nghiên cứu về lao động) comes from two Greek words: ERGO: meaning work — NOMOS: meaning laws. Ergonomics is a science focused on the study of human fit, and decreased fatigue (sự mệt mỏi, sự mệt nhọc) and discomfort (điều bực dọc, nỗi lo lắng) through product design. The references will explain some of the human factors that can be observed and should be applied to ergonomic product design. 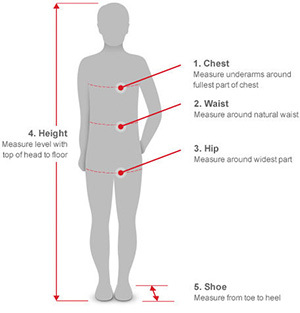 Ref A: Anthropometry simply means "measurement of people. It's the study of the size, shape and strength of the human body, including, mass, volumes, mobility, proportions, center of gravity, and inertial properties of the whole body and body sgments. Definitions & Applicability. 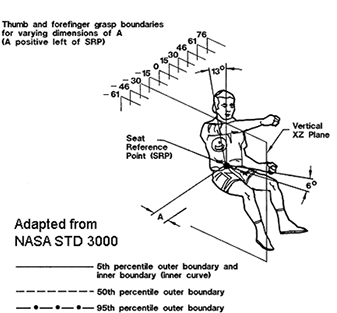 Human Factors/Ergonomics Handbood for the Design for Ease of....from Department of Energy HDBK-1140-2001. Ergonomics and Design – A Reference Guide – Compiled and Written by Scott Openshaw, Allsteel Erin Taylor, Allsteel, Gailyn, Woody Witherow, TJ Long, Marcus ford. 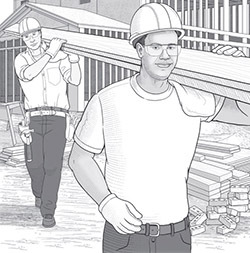 OSHA is a part of the United States Department of Labor. Occupational Safety and Health Administration created to assure safe and healthful working conditions for working U.S. workers by setting and enforcing standards and providing training, outreach, education and assistance.